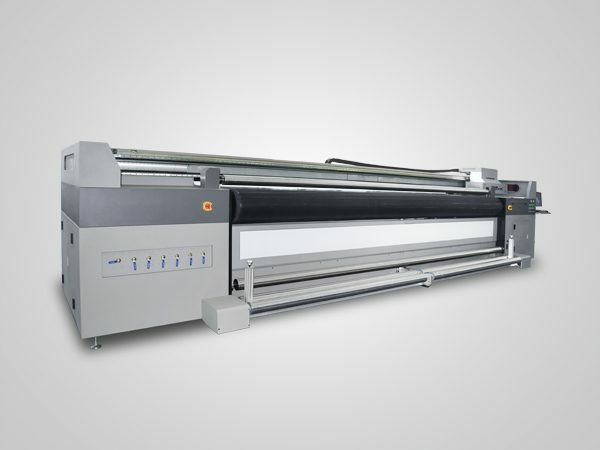 As the latest addition to YOTTA’s family of UV LED flatbed printer, YD-F2513KJ delivers ultra-high resolution of 635×2400dpi. This is a new series adopting Kyocera printheads, industrial inkjet print heads featuring 4pl droplet printing, delivering unparalleled results on almost all kind of flat materials with ultra precision and high print speed on its tough 2.5M×1.3M platform. With 2.5M×1.3M large print size, this uv led flatbed printer is configured with metal-made and high precision grating ruler to guarantee the printing effects. Standard C, M, Y, K, Lc, Lm color printing produces outstanding colorful prints, and white ink and varnish printing restores your imagination and take the products to a new level. 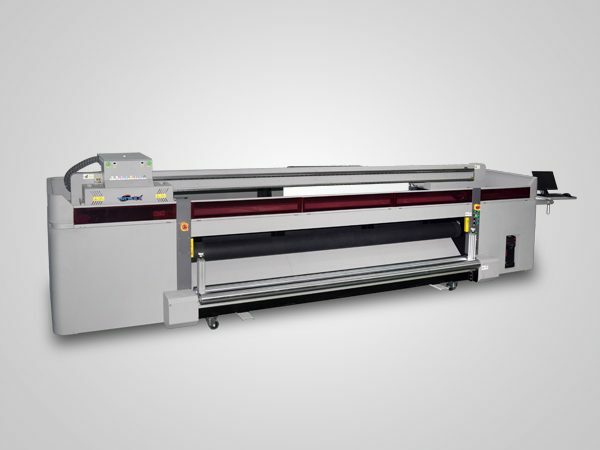 Equipped with anti-collision and media positioning device, this easy-to-operate machine provides a unique solution for kinds of printing business. 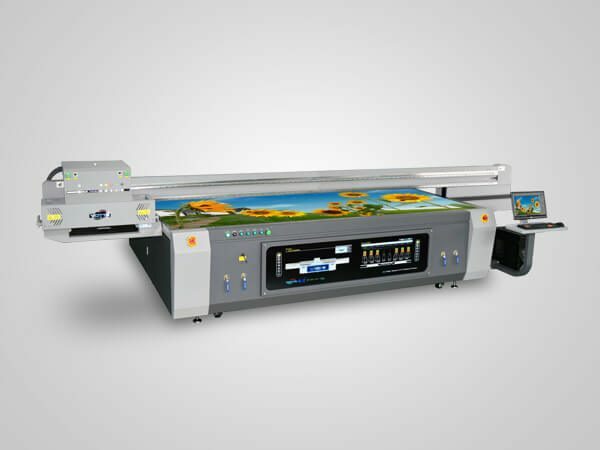 The YD-F2513KJ uv led flatbed printer adopts 3-8pcs industrial Kycorea printheads, delivering exquisite results with 4pl ink droplet and 600 × 2400dpi. The printer head we adopted has powerful internal heating function to keep the constancy of ink viscosity. It jets 40,000 droplet per second with one nozzle, and overall one printhead can print over 1 billion droplet per second, specially suitable for large-area panel and fast production. YOTTA’s YD-F2513KJ uv led flatbed printer delivers direct inkjet printing to substrate, no need to transfer, convenient and quick. When printing, printhead keeps the best 2mm distance with materials. YD-F2513KJ uses kyocera printhead, which is a high speed industial printhead and can satisfy mass productive with high speed mode. Three printing modes can be chosen by customers according to actual production requirements. Our digital UV printers employ UV LED curing technology, which won’t generate excessive heat, allowing fast UV ink curing and direct-to-substrate printing on almost anything, heat-sensitive materials included. In addition to creating bright and colorful prints with standard 6 color, YD-F2513KJ printer also support direct-to-substrate UV white ink and varnish printing. White ink can be printed in a variety of ways with this machine to produce vivid prints. Just enjoy your imaginative design and it will help you achieve. a. Media positioning device, more convenient to position the substrates being printed, to achieve more accurate positioning and printing easily. b. Anti-collision device. When colliding with obstacles, the carriage will stop automatically to protect the print heads, as well as human safety. 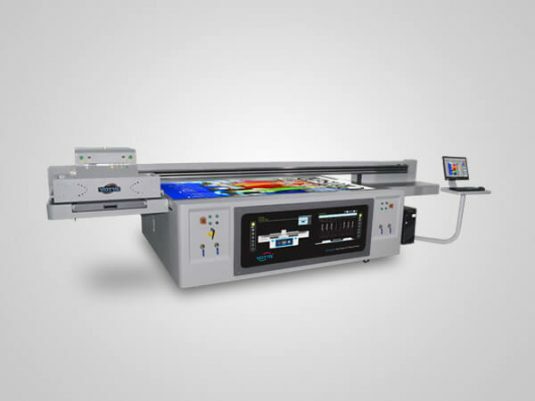 c. Four zone independent control absorption platform, delivering high accuracy printing for various sizes of flexible materials. d. Intelligent and user-friendly RIP software. YOTTA printers are equipped with multifunctional and and user-friendly RIP software, to improve designed image output efficiency. YD-F2513KJ LED UV flatbed printer has two negative pressure system in secondary ink cartridge to control white ink and color ink separately, so to ensure a smooth printing process and outstanding printing effect. The pressure value can be checked and adjusted according to production environment. Our machines use environmental-friendly UV curable ink and UV LED lamps for ink curing, no VOC, operator-friendly, less heat waste and saving energy.